Reach Out and Read (ROR) makes literacy promotion a standard part of pediatric primary care at all Ochsner Health Centers, encouraging children to grow up with books and a love of reading. Reach Out and Read trains doctors and nurses to advise parents about the importance of reading aloud to their children and to give new developmentally appropriate books to kids at pediatric check-ups between the ages of 6 months and 5 years, with a special focus on disadvantaged children. By building on the unique relationship between parents and pediatricians, Reach Out and Read helps families and communities encourage early literacy skills so children enter school prepared for success in reading. In the past 12 months, we have trained 30 pediatric providers and their staff in ROR. 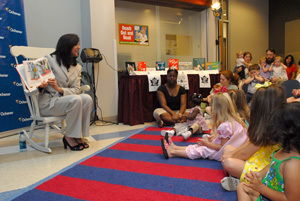 After our Kickoff event at Ochsner Children's Health Center in May 2009 featuring guest reader/speaker First Lady Supriya Jindal and Ochsner CEO Dr. Patrick Quinlan, we have opened ROR programs at the following Ochsner Health Center locations: Metairie, Destrehan, Slidell, Covington, and Baton Rouge clinics--Bluebonnet, O'Neal and, very soon, Prairieville. We estimate that we have distributed over 6,500 books in our first year and hope to provide over 15,000 books to children in our practices in our second year. In addition to book distribution, we have placed shelves of books and trained more than ten volunteers to serve as readers in our waiting rooms as we create a literacy-rich environment in our medical homes. We have also reached out to high risk populations cared for by our staff and residents at locations such as Covenant House. A hospital-based Ochsner Children's Library has been created in the Ochsner Medical Center Medical Library so that parents can check out books for their hospitalized children. Books have also been distributed to children in the Craniofacial Clinic as children with craniofacial anomalies are at very high risk of communication disorders and benefit greatly from early exposure to books. This was made possible by a generous gift from New York-based Smile Train. In addition to our own patients, we have committed to provide books to clinics in New Orleans serving high risk children and teens. Generous grants from the American Academy of Pediatrics-Louisiana Chapter have allowed us to provide books for our residents to distribute in their Continuity of Care Clinic at Ochsner Medical Center, the Mobile Pediatric Bus Unit and at Covenant House as a partner with Louisiana Reach Out and Read. In June, we assisted in training all Tulane-Ochsner and LSU pediatric house officers in ROR. Sustainability is a key objective for the ongoing success of our program. To date, we have received over $80,000 in corporate gifts, grants, pediatric fundraising activities and personal donations. We most recently received a $25,000 gift from the Fore!Kids Foundation and $10,000 from the George Shinn Foundation which will provide needed books to all clinics for the upcoming year. We estimate that we will need roughly $50,000 a year to sustain the program throughout our institution. Our goal is to educate all of our families and our community in the fundamentals of early brain development and to demonstrate the power of reading to young children. Our long term goal is to help establish literacy promotion at all ages. We hope to partner with our adult colleagues in the identification of illiterate adult patients and to develop resources for these patients. Ochsner also hopes to spread our message throughout the community. Click here to read more about the Reach Out and Read program. To apply to be a volunteer with Reach Out and Read, click here.